The lambs have been fed and everyone is safe. . .
Time for a little shut eye before all night guard duty starts. 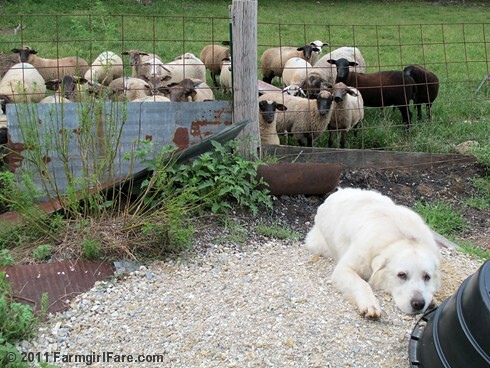 Just getting to know our Great Pyrenees Crazy Daisy? 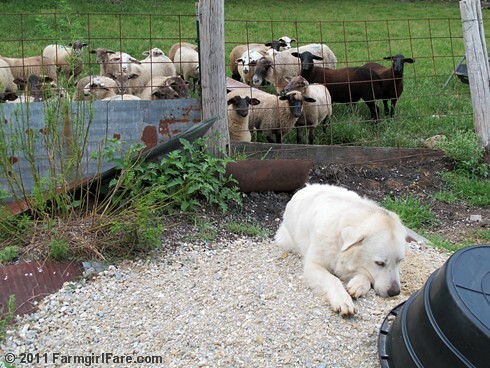 © FarmgirlFare.com, where we call her Crazy Daisy because she goes crazy (in a cracks-you-up kind of way) whenever it's time to eat—even if we're just serving plain old kibble. Poor Daisy! No naps when Bert is around! Bert thinks it's always play time. Maybe if he helped Daisy all night he would sing a different tune. But then again, maybe not. She's a pretty girl! And, BIG!! !